Username: Type your username in this field (not for Persona, SSO or Moodle accounts). Persona login: If you log in via Persona, please use this login button instead of the login form. If you log in via Persona, SSO or Moodle for example, you must retrieve your password directly from these services. If you do not know how to do that, please ask your administrator. 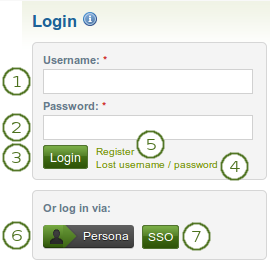 You only see the Persona and SSO buttons if these authentication methods have been enabled on your site. Username: The username is displayed to indicate who is logged in esp. when viewing portfolio pages where the profile block is not visible. This feature is only present when small page headers are not turned on. You can click on it to go to your profile page. User search: Search for users who have an account to view their profile page and check which pages they have made accessible to you. Quick links: These quick links take you to certain areas of Mahara quickly. Your profile picture is linked to your profile page. If you tagged artefacts or pages with the tag “portfolio”, a link to them is placed here. Links and resources: List of links to web sites or documents that are visible to all logged-in users or the public. When you display messages from other users on your dashboard through the My inbox block, you can see quickly which messages you have not read. They are marked in bold and have a closed envelope. Messages you have read are indicated by an open envelope. If you removed these boxes from your dashboard but want to get them back at a later point, you can re-active them under Settings → Homepage information. 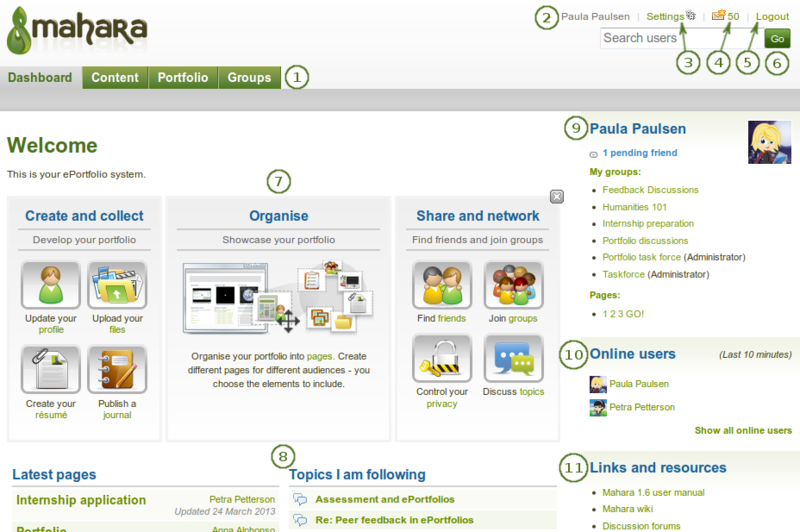 These areas are filled with content once you start using Mahara and create pages, receive messages from other users, have access to others’ portfolio pages and use the forums for discussions. You can customize this area to your liking by editing your dashboard in Portfolio → click the Edit button next to the dashboard page → change the blocks like you would change them on any page in Mahara.